The Queen, Colonel-in-Chief, presented New Colours to the 1st Battalion and F Company Scots Guards at Buckingham Palace. She was accompanied by The Duke of Kent, Colonel of the Regiment. 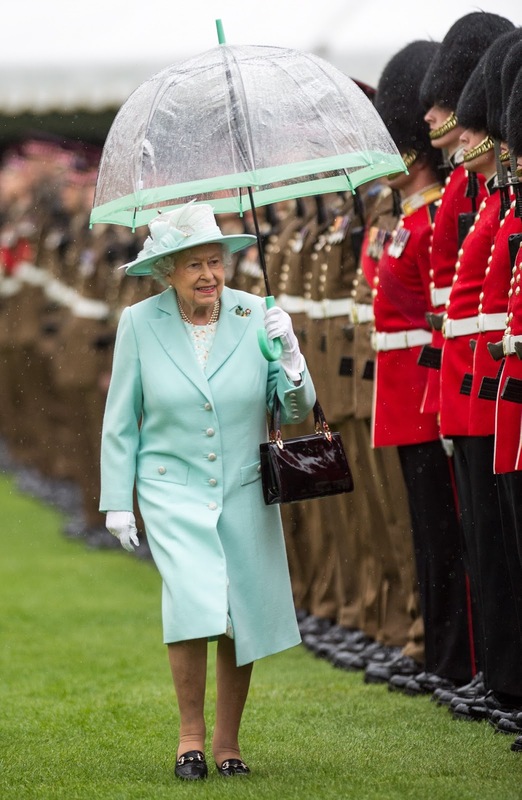 "As the heavens opened with soft penetrating rain reminiscent of the Highlands Her Majesty The Queen, Colonel-in-Chief Scots Guards, presented new Colours to the 1st Battalion Scots Guards and F Company Scots Guards in the Gardens of Buckingham Palace. The wisest of the 2,200 assembled guests endured the unrelenting downpour beneath umbrellas, others trusting the fine forecast and unprepared for a turn for the worse, bravely bore the torrent that ensued with typically good British humour. 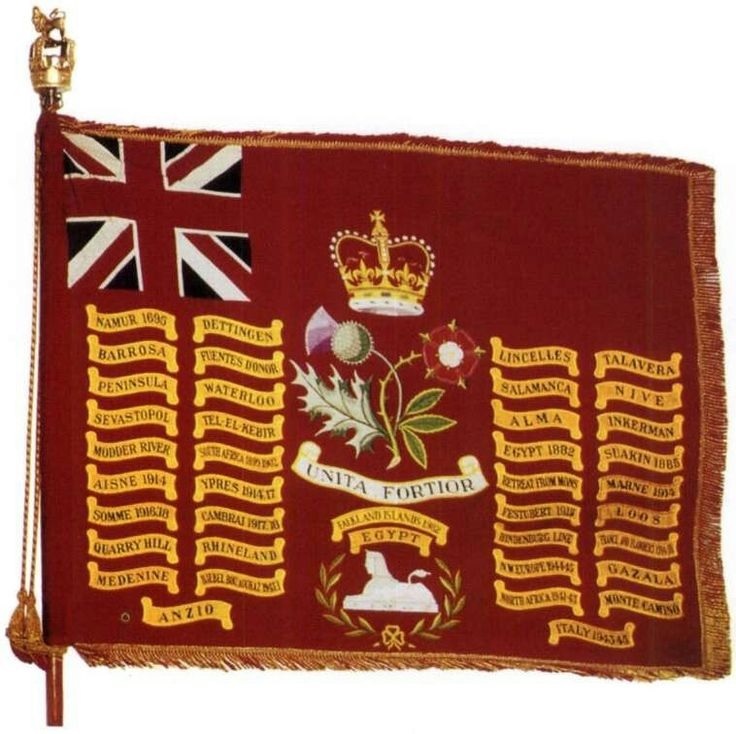 The presentation of new Colours is a rare honour for all soldiers and officers involved and this new set of Colours is the first the company has received since 2002. "On the lawns in front of the Bow Room, Buckingham Palace, The Queen inspected the parade and presented the new Colours to The 1st Battalion and F Company Scots Guards. While bearskins dripped, and the shoulders of service dress turned a darker shade of khaki, the soldiers stood proud in front of their Colonel in Chief." The Queen's brooch, which was partially obstructed by her lapel today, is an interesting take on the regimental badge. Though it is new to this blog from this appearance, it is not new to Her Majesty; she wore the same brooch in 2002, the last time she presented Colours to this regiment. The badge features one green thistle and one Tudor rose with its distinctive red petals and white center, with yellow gold and perhaps enamel. That symbol can also be seen in the example of the Scots Guards flag below. As with the rest of her regimental jewels, this brooch is reserved for regiment-related events, and is thus not seen often.